In our continuing effort to give back to the environment, POWERS Insurance and Risk Management is proud to announce that it will plant a tree for every new client! The new policy will start with any client that joins POWERS Insurance and Risk Management. This campaign coincides with our carbon neutral efforts and will be in place for any new client, regardless of the premium that client pays. We hope our clients can embrace this campaign like we are and we encourage all of our clients to match our contribution and plant a tree themselves to help preserve the planet. At the very least, we hope you will feel better knowing that you can say you have embraced a carbon neutral relationship with your insurance agency. We believe in making the world a better place for the next generation – It’s good policy. Will you join us? Can you plant a tree in my yard? 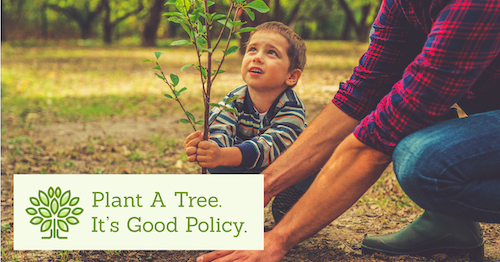 While we can’t plant a tree on your property, we encourage you to match our contribution to preserve the planet by planting a tree on your property. Where will you plant the trees? We have purchased a piece of land for this specific project along the Meramec river. We will also plant trees across Missouri, e.g. State Parks, Forest Park, North City, and other areas in need of beautification. For every 250 new clients, we will plant a large tree in an urban area in need. For every 1000 new clients, we will farm a beehive to help preserve the bee population and protect our agriculture from colony collapse disorder (CCD). You will be able to say you have embraced a carbon neutral relationship with your insurance agency to protect our shared environment. What type of trees are being planted? Every tree we plant will be native and resistant to invasive species, e.g. Willow, Sycamore, Black Walnut, Hickory, White Oak, and Maple. Most will be saplings, but we will plant large trees for milestone moments as well as farm the occasional beehive. Can I get a virtual “in memory of” or a certificate with my tree planting? We would love to include names in honor but we do not want to include plaques around every tree. We will send an acknowledgement email to all of our clients with pictures of the plantings. What will you do with the honey from the hives? We will not mess with the hives, we will leave them alone. What other things are you doing to encourage a carbon neutral environment? A carbon neutral environment is something we hope to continue to embrace, both as a company and as a community. Policies are sent electronically to our clients to eliminate paper documents and our agency is on the fore front of using web based communications. We completed our energy efficient office and recycle as much as possible. We also limit our business travel and attempt to drive vs. fly for the majority of our business trips. Why can’t you plant a tree on my property? Our goal with this project is to place trees in areas where they can maximize their positive impact on the environment, which means that we will be planting many trees in groups to reduce watershed and erosion. How do you farm a beehive? We plan to place them and let them exist naturally and we encourage you to research the information you are looking for and do your part to help the bee population by planting native wild flowers at your home. Why is this important to Powers Insurance? Because It’s Good Policy to make the world a better place for the next generation. We cannot take donations, but you can plant your own tree or make donations to charities, non-profits or others who work with the environment. Will I be charged for the tree? No, we are doing this on your behalf. Why are we planting trees as opposed to planting flowers, fruit, or vegetables? We think a tree is a great representation for an insurance policy. It never stops growing; it takes root with an intent to stay forever; it adapts to the seasons; and it provides protection over us when needed. Who will be planting the trees? Can I or my family be involved with the planting? Absolutely! We will have a public planting event annually. Subscribe to our company newsletter to make sure you are in the loop! Can I suggest a place that is need of this service? Yes, we’ve had other clients suggest areas in need of forestry, so thank you and we will put the area on our list for future beautification on your behalf.